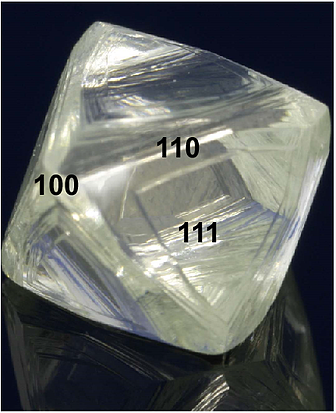 The image of a rough diamond below is annotated to show the position of the three possible crystal faces (octahedral -111, dodecahedral -110 and hexahedral or cube faces-100) of a diamond. I am adding the Miller indices for convenience, hence the numbers. There is a total of 6 cube faces (100), 8 octahedral faces (111) and 12 dodecahedral faces (110). The 111 faces are the hardest, in fact they are near impossible to cut and polish. The next hardest are the 100 faces, followed by the 110 faces. This variance can be proven on the atomic level, which is outside of the scope of this article. Diamond polishers have to know the orientation of the crystal and avoid having facets coincide with the 111 and 100 faces. Working on a rough diamond is a piece of cake as the crystal orientation is clearly visible. This is however not the case with polished diamonds. If there are no naturals present on a diamond, it is very difficult to determine the crystal orientation i.e. knowing where the various crystal faces are. This could lead to problems for polishers when re-cutting a diamond. 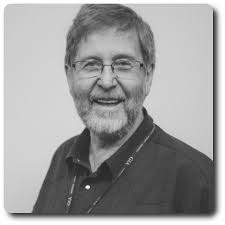 The matter is more complicated when the goal is to achieve triple excellent cut grades, and even more so when tight weight thresholds have to be preserved. This will not allow for slight re-orientation of the diamond. Then there is the matter of graining and twinning. Twinning is when a part(s) of a diamond’s crystal orientation does not conform to the crystal orientation of the ‘main stone.’ Whenever twinning is present on a facet, the cutting direction of the facet could be diametrically opposite for the twinned portion to that of the main diamond. It is like asking a person in Oklahoma city to travel to New York and Los Angeles at the same time. Polishers have to alternate the polishing direction, which is a time consuming exercise, often with compromised surface finish. This causes the surface to be uneven and worst still to have drag lines coming off the twinning. Re-cutting diamonds is therefore a highly specialized skill with complicated challenges as mentioned before. Some diamonds for reasons mentioned can never obtain triple excellent for polish. As far as symmetry and cut is concerned, there should be no reasons for not achieving excellent. Jewelers can look out for possible challenging diamonds by inspecting them for signs of twinning. If there is a twinning line parallel to the girdle on the pavilion side, then it is not much of a problem. If it however runs oblique to the girdle, crossing into the crown or worst still more or less perpendicular to the girdle, then there is potentially a severe polishing problem.